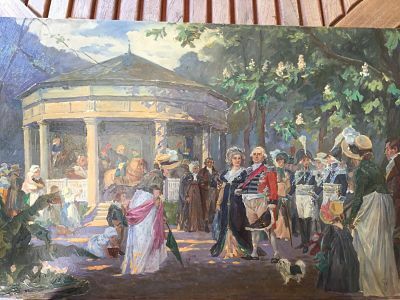 This is a painting from near 1850 that depicts a (famous) French man, possibly noble, in a park, maybe Paris. Is he a Minister? King? Military? Whoever he might be, I consider he is important, since the people around bow before him (the woman). Can anyone tell me who this man is? The reason there are errors you can't reconcile is that this is not painted from life. This is a lady of 1850. After this the hoop skirts only get bigger. 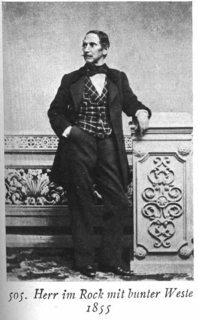 This is a gentleman of 1855, who wears trousers and a frock coat. The people you see here are from decades earlier. The gentlemen wear swallowtail coats with breeches and stockings. The women wear the Empire waist, soft white gowns, and spencer jackets, with long shawls off their elbows, not big triangular ones covering the upper body. In short, your Spanish painter was painting a scene out of the Napoleonic period, or shortly thereafter. 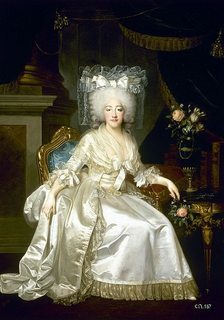 The supposed queen wears the high waist, but her hair is that of before the Revolution, afro curls powdered over, while the "king" wears a powdered wig that would suit even the 1770s. This means, depending on how good the painter's research was, he could have stitched together reference materials that were not compatible. This could explain the sash being the wrong side, besides the anachronisms. 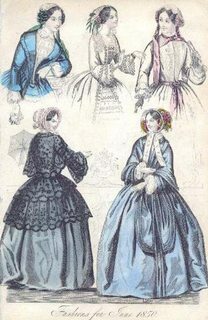 The women are mostly dressed 1810, with the queen wearing what is not really a walking dress, and lacking a bonnet. I would say she and the king are copied out of more official portraits. 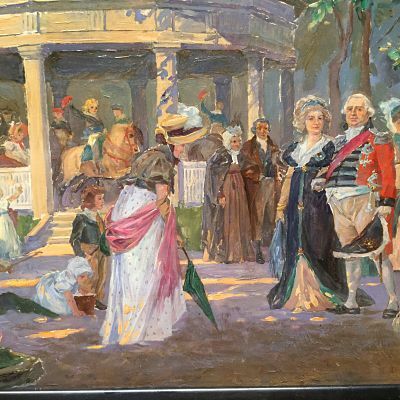 At this point, you can only guess at what he was attempting to portray with his linseed oil time machine.Locating the structure in the back (I believe it is a carousel) will tell you where, though the guardsmen tend to indicate France -- but maybe not Paris. 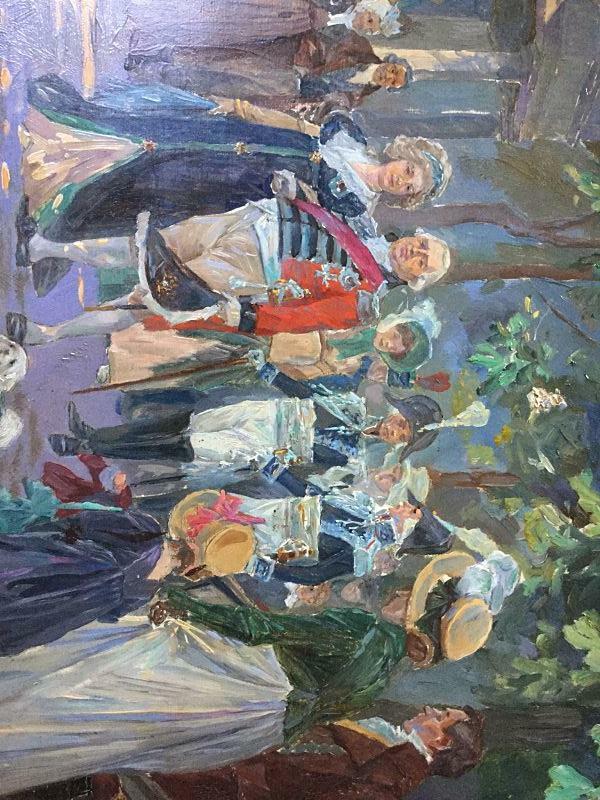 This could be a fantasy of Louis XVIII going for a stroll -- it needn't connect well with reality. My three cents' worth, from studying the era 1803-1816, and training in portraiture, is that the king lacks the jaw structure of either George or William IV. He isn't Hanoverian. This is a picture of King Louis XVIII of France. The coat he is wearing closely resembles that of the Gendarmes de la Maison militaire du Roi during the First Restoration (red cloth, horizontal lace and black velvet on the chest, etc.) As for why the lace and epaulets appear silver rather than the regulation gold, this is perhaps an affectation of the king, or an artist's error. To those hung up on the red, recall that since the time of Louis XIV the Maison militaire du Roi had two broad groupings, the Maison bleue and the Maison rouge, based on the color of their coats. In the latter, during both the First Restoration and the Ancien Régime, we find the Mousquetaires, the Chevau-légers, and the aforementioned Gendarmes. The military figures (in bicornes with plumes) in attendance behind Louis XVIII are officers of the Gardes du corps du Roi, a Maison bleue unit of the Maison militaire du Roi. The six (reduced to four at the start of the Second Restoration) companies of this unit were each identified by a distinctive color. Here this identifying color should be noticeable at the base of the plume, in the shoulder straps, and worked in to their waist sashes, but it seems unclear -- perhaps green, which would identify the company as that of the Duke du Gramont. As for precisely dating the scene between 1815-1824, this would hinge on whether or not Louis's coat is indeed intended to be that of the Gendarmes, who along with several other Maison units were dissolved at the start of the Second Restoration. It would be odd for the king to wear the uniform of a disbanded unit, as this was a disagreeable act to many in the French nobility since they lost position and prestige. A more likely possibility than General Colbert is King William IV with his (much younger) wife Adelaide. They married in July 1818. Even after his ascension in 1830 William was known to walk around London and Brighton unaccompanied by guards , as here. However the issue of the sash being worn on the wrong shoulder occurs again, and whether he was in the habit of making these walks in military dress I cannot determine. Update: It is worth noting that the facial features as painted much more closely resemble William IV than General Colbert, who appears to have retained his slim facial features until his death. 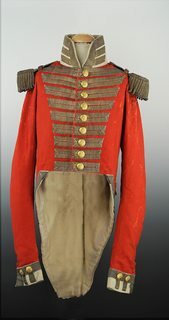 In the British Army of this time (early to mid-nineteenth century) the red sash was simply an emblem of rank, with sergeants wearing it over one shoulder and officers over the other. 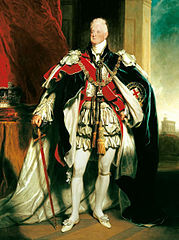 However the references I have found to "the knot" placement seem to be opposite to how William IV is wearing it in his official portrait here (as I presume the monarch's rank is not sergeant). The only French unit I am aware of that wore red uniforms was the Red Lancers, Second Regiment of Light Horse Lancers of the Imperial Guard. The uniform might be that of a Red Lancers officer, but the painting doesn't give enough detail to be sure of much besides the colour. The red sash and impression of a distinction on the left breast might be that of the Grand Cross of the Legion of Honour as shown here, except that the sash is being worn incorrectly; while the sash of a Red Lancer is worn on the left shoulder that of the Legion of Honour Grand Cross is worn on the right shoulder. Military officers never get this wrong, but painters might. 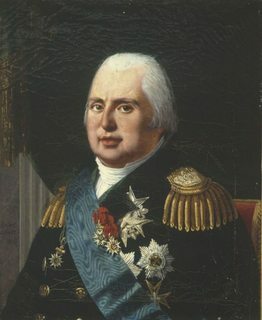 The most distinguished member of the Red Lancers in the decades following Waterloo was Pierre David de Colbert-Chabanais, who commanded the regiment from their creation in 1811 through the Russian campaign and into 1813, until promoted General de Brigade and then General de Division. After serving as Inspector General of Cavalry from 1826, he was made a peer of France in 1838, Grand Cross of Legion of Honour in 1839, and lived until 1853. This might be the gentleman in your painting, though portraits of General Colbert never show him wearing the uniform of a Red Lancer, despite his apparent fondness for the uniform on the battlefield, [Update] and suggest that he retained his slim facial features until his death. The two officers behind the man in red look like they are wearing French Gendarmerie uniforms. Also, are those mountains in the back? I'm not sure the guy is English, despite his red jacket. The soldier in the far back wears a heat with a red hackle. 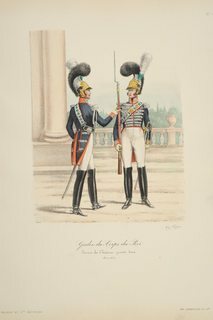 The French Garde Republicaine wears similar hats with red hackles. I think it is almost certainly one of the restored Bourbon monarchs, either Louis XVIII, Charles X, or Louis Phillippe. If the timing is correct then it would probably have to be Louis Philippe. 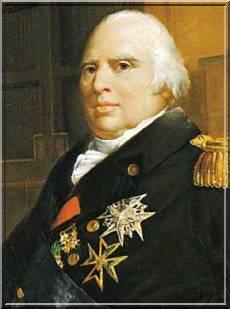 By dress and appearance it looks much more like Louis XVIII of France. The emblems he wears are not fully recognizable, but appear to possibly be the Order of the Holy Ghost with the Toison D'or, the Order of the Golden Fleece, suspended directly below it. If correct, this would definitely point towards a king, particularly Louis XVIII. 1/ About the spouse of Louis XVIII : she died (in England, 1810) some years before her husband turned a French monarch ! Not the answer you're looking for? Browse other questions tagged 19th-century france art identification or ask your own question.